Great American Loop 1998-2013: The path here (as hiked in sections by Nimblewill Nomad) was created by connecting certain existing trails, portions of trails, and roadwalks together. As shown, this amalgamation forms a continuous route around all four sides, and to each of the furthermost corners, of the United States. The eastern, northern, western, and portions of the southern sections have been accomplished through treks the Nomad made between the years 1998 to 2012, and the remaining miles needed to close the southern gap is what this years odyssey is all about. Starting at Hachita, NM, roadwalking 1,555.5 miles to just east of Milton, FL will close that gap and bring about the completion of the Great American Loop (GAL). At 9:30 Friday morning, June 28th, the Nimblewill Nomad reached the intersection of FL-87 and US-90 east of Milton, Florida, to successfully complete Odyssey 2013, the Great American Loop (GAL). A trek of 1,555.5 miles, entirely a roadwalk, and a very difficult go at times. Thanks to all who offered their support and encouragement -- true blessings! Odyssey 2013 was destined to go down as an extraordinarily grand affair, perhaps Nimblewill's final adventure, one he chose to call the GAL (Great American Loop). Over the years, having envisioned no grand scheme, with no predetermined design or plan, dawned on the old fellow a year or so back that he was well on his way to trekking down the outer fringes of the entire lower 48. Yup, a path clear around our beautiful US of A--all four corners, all four sides. If you've followed the old intrepid's wanderings even the least over the years, you'll know how he likes to connect places, hook them together, by trail, roadwalks, bushwhacks, whatever it takes. His very first long trek pieced together road and tread, a trail spanning near the breadth of the eastern North American continent. It's since become known as the ECT (Eastern Continental Trail). 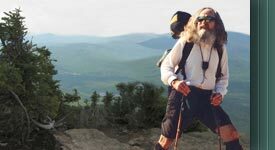 In 2004-'05, a young, ultra long-distance hiker named Andy Skurka became the first to hike an amalgamation of roads and tread known as the C2C (Sea-to-Sea Route), a trail crossing the upper reaches of the United States, from the Atlantic to the Pacific. In 2007, not content, Andy kicked up a cloud of dust that hasn't settled to this day. He hooked the Continental Divide and Pacific Crest National Scenic Trails together, then to hike that amalgamation in one continuous trek, a trail he's named the GWL (Great Western Loop). Since, and to chime in the least, Nimblewill has cobbled together his own versions of the GWL and C2C. And so, as for the GAL, of the near-countless miles around and across the lower 48 Nimblewill has hiked over the years (the byways and trails), connecting 18,257 of them now track the entire GAL--now including the 1,555.5 miles from the Continental Divide Trail in New Mexico to the Florida Trail in the Western Panhandle. So, as to this last segment of this last and final leg, as to the completing of it to close the loop that is the GAL? Well, that's what Odyssey 2013 was all about! This section of the website features a map of the GAL, how everything connects and fits together. The legs are divided up in Eastern, Northern, Western, and Southern sections, with each of the 4 offering clickable links to dates and mileage information, along with links to daily journal entries for each of the four legs. As usual, this odyssey section also contains a list of Nimblewill's sponsors, his gear, and his itinerary, along with his journals, photos, and videos from along the trek.